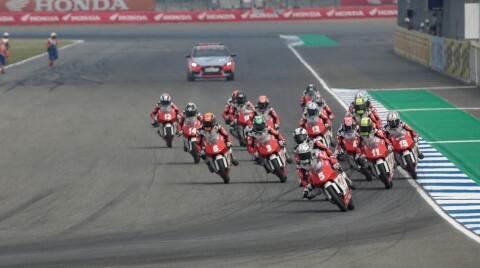 Afridza Munandar took his first ever Idemitsu Asia Talent Cup win in Race 1 at Chang International Circuit, pitching it to perfection in a frantic final corner to emerge ahead of Japanese duo Sho Nishimura and Takuma Matsuyama. As ever, everything went down to the wire in a last dash shuffle, but the Indonesian emerged ahead to open his victory account. 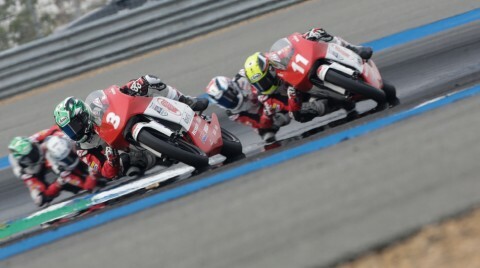 At lights out it was home hero and pacesetter in practice Tatchakorn Buasri who got the holeshot from pole, but Takuma Matsuyama struck early and made it past two riders in Turn 1 to take the lead. From there it was the Japanese rider dueling Buasri initially, but a group was on the chase comprised Adenanta Putra, Munandar, Nishimura, Warit Thongnoppakun, Piyawat Patoomyos, Adbul Mutaquim and Shoki Igarashi. As the race settled into a rhythm, however, it was Matsuyama leading a group of five at the head of the race and Thongnoppakun seeming to start to fade. 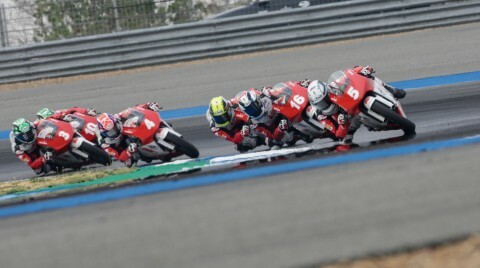 Soon after though, the Thai rider got his head down and closed back in on the leading quintet of Matsuyama, Putra, Munandar, Buasri and Nishimura to make a lead group of six, but it wasn't long until Indonesian rookie Herjun Firdais was able to get in the mix too. Chopping and changing and jostling for position, the laps ticked down until the hour of reckoning: the final lap. By then Firdaus was struggling to tag back on to the group and the stage was set for a six-man tussle at the final corner - exactly what it became. Buasri seemed to have found himself a little out of position for an assault on the win and Putra had suffered a big moment not long before, but the final turn , as it would turn out, belonged to Munandar. The Indonesian went bravely round the outside, able to keep his speed up and avoid the squabble at the apex before gunning it to the line in style, just ahead of those nipping at his heels. It was elbows out to complete the podium though, with Nishimura just able to hold off Matsuyama in some Qatar deja vu to keep his Championship lead, with home rider Buasri left off the podium in fourth. For the polesitter and the pacesetter for most of the weekend, that will be something he'll be desperate to improve on in Race 2. That's it from Race 1 and Nishimura remains ahead in the standings, but there's a chance for those who just missed out to try and turn the tables on Sunday. Tune in for more Idemitsu Asia Talent Cup action in Race 2 from 11:45 (GMT +7)!